German river towns such as Passau, Koblenz and Wertheim have a special allure for travelers. Not only are they filled with charm but since they were centers of commerce in previous centuries, they’re historical as well. Many of these towns had lost their luster in the mid-20th century with the rise in popularity of railroads and airlines. Larger cities had a larger commercial base and were able to survive, but smaller towns saw hard times. Many became just another sleepy little village along the water’s edge. This is especially true in Germany where countless towns – some now large commercial centers, others still in a near-fairytale state – populate the banks of the Rhine, the Mosel, the Danube and other waterways. Here are six unique German river towns that have once again become popular ports as they cater to travelers from around the world. Each is worth visiting whether you’re on a cruise or just touring about the country. Passau is an old Roman town, built as a trading port due to its important location at the confluence of the Danube, Inn and Ilz rivers (the reason it’s also been called Dreifluessestadt, the “City on Three Rivers”). It’s a picture-perfect postcard Bavarian town still filled with the Old World charm. 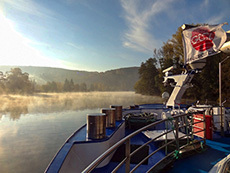 You can visit it on both Danube River cruises and Rhine River Cruises. I vividly remember seeing Passau for the first time a few years ago as I stood on the deck of a Rhine River cruise ship early one October morning. As the sun broke through wisps of river fog I watched smoke waft from the chimneys of little riverbank houses as we slipped silently along the Danube. It was a beautiful experience. One of Passau’s claims to fame is the huge pipe organ (with 17,774 pipes, making it the largest in Europe) in the Baroque St. Stephan’s Cathedral. Pay the church a visit but don’t spend a lot of time here since there’s much more to see in town. Visit the Passau’s Rathaus, the old Gothic City Hall down near the river, which was cobbled together from eight patrician houses. On its exterior you’ll see the high water flood marks that occurred over the centuries, the highest in 1501. 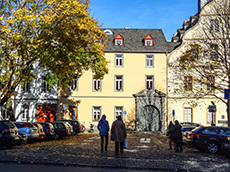 Also visit the Veste Oberhaus (the former castle of the prince-bishops and now a regional museum), the well-regarded Passauer Glass Museum and the Old Bishop’s Residence. You’ll find much of the city to be a warren of little medieval-like streets with multicolored buildings housing shops, restaurants and apartments. Rest for a while at one of the many cafés in the colorful Rindermarkt. On the banks of the Regnitz River, which converges into the Main, Bamberg is one of Germany’s most beautiful cities, a town of narrow cobblestone streets, ornate mansions, palaces and impressive churches. 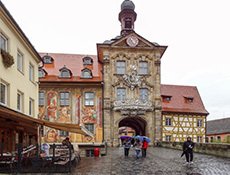 A UNESCO World Heritage Site that dates to AD 902, Bamberg’s 1,000 years of architectural style includes Romanesque, Gothic, Renaissance, Baroque and 19th-century eclecticism. 2,000 buildings in the city are listed as historical monuments, and its old city center is Europe’s largest existing group of historic buildings. 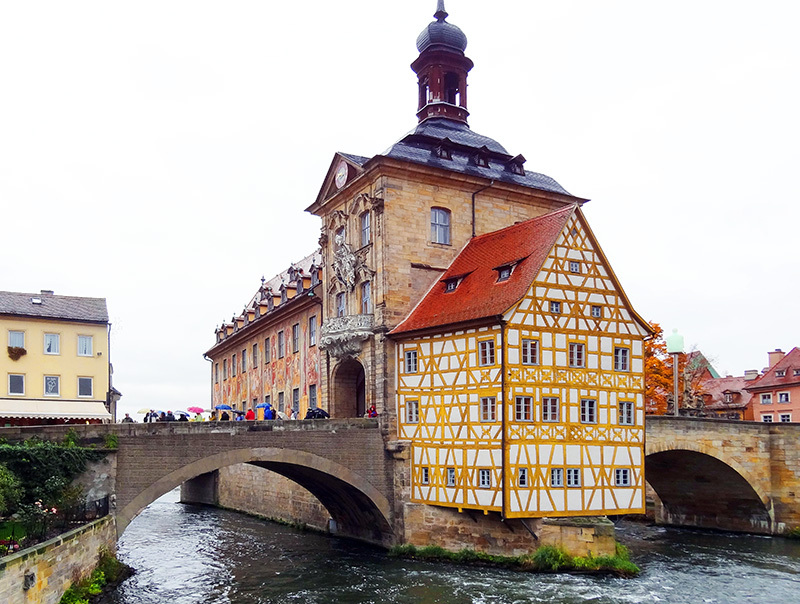 For many people Bamberg is Old Germany at its finest, a beautiful little city where seemingly everywhere you turn you find old timbered houses on one street and an old Wedgewood-style of architecture on another. It’s a city that screams with color, from pastel buildings to the blazing red geraniums tumbling out of window boxes. Be sure to visit the 800-year old, triple-nave Bamberg Cathedral, the final resting place of Pope Clement II, and home to the famous equestrian statue of the “Bamberg Rider” whose identity has remained a mystery for centuries. Nestled on the banks of the Nectar River, Heidelberg is set in another picture-perfect setting with an old bridge spanning the river below a beautiful Gothic Castle that dominates the city from the hillside above. In reality though, the castle is mostly in ruins, although a section of it is still a residence. Visit it and from its terrace you’ll have a beautiful view of the city below. Before you leave also view the huge wine barrel in the castle’s cellar near the restaurant. 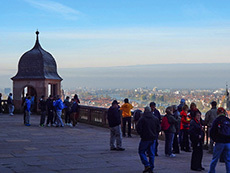 Heidelberg is one of the most visited cities in Germany for day-trippers and is home to Germany’s first university, established here in the 14th century. 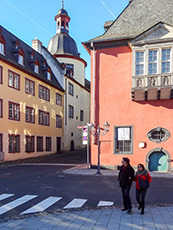 It’s still a university town and you’ll see students as you wander along Hauptstraße or another of Heidelberg’s beautiful streets, all lined with wonderful shops and restaurants. Be sure to leave yourself time to enjoy lunch dinner in a traditional Gasthaus that have been part of Heidelberg’s Baroque Old Town for centuries. Although a great part of the city was destroyed by bombings in World War II, today most of the city’s historic buildings have been reconstructed. One of the best-known sites in the city is the Deutsches Eck, a prow-like bit of land that juts out into the river where the Rhine meets the Mosel. Go to Koblenz’s 18th-century Rathaus (City Hall) and pay a visit to the courtyard behind to see the famous statue Das Schängelchen (“The Spitting Boy”) designed to honor the city’s children. Later visit Liebfrauenkirche (Church of Our Lady), a 13th-century Gothic basilica. 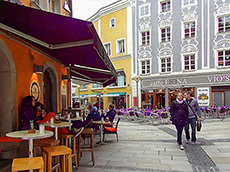 This is wine country so spend time sipping a glass at one of the Koblenz’s many sidewalk cafes, or just stroll the streets and browse through little markets. 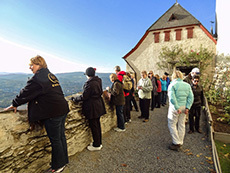 Leave time, if you can, to go up the Rhine to the town of Braubach to visit Marksburg Castle, the only hill castle on the Rhine that has never been destroyed, and remains unchanged since medieval times. Be forewarned that it’s a steep (although short) climb up to the castle even after you reach the parking lot. 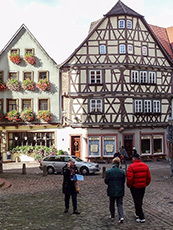 Wertheim is a market town located at the confluence of the Main and Tauber Rivers. It’s a small, charming town that’s very easy to walk about and it doesn’t get a lot of tourists, which makes the city all the better to visit. There’s a nice Glass Museum in Wertheim that is well worth visiting, not only for the things you learn about glassmaking but also for the beauty of everything in the place. 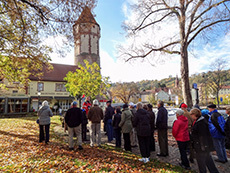 Also visit Wertheim’s 14th century church in the center of town – it was used as both a Catholic and a Lutheran Church, and is famous for the huge crucifix with the life-size figure of Christ that hangs above the altar. On the church’s clock tower you’ll see that one face has only one hand, the other side as two. The reason is that when the church was built they did not yet have the technology to make two hands on a clock. If you get hungry when visiting Wertheim, grab a bite at the Golden Eagle restaurant on the market square, said to have the best sausage in town. It’s an old restaurant: Martin Luther once ate there and forgot to pay his bill. Regensburg, on the Danube River, is Germany’s largest medieval city. It’s a quiet little town with beautiful Baroque buildings that, luckily, were undamaged in World War II. Today it remains beautifully preserved. The city is home to Germany’s oldest bridge, the famous Stone Bridge, at one end of which is the Historische Wurtsküche, a 500+-year-old cottage-size wurst restaurant reputed to be the oldest wurst house in Germany. It’s a great place to stop for a beer and wurst. The entire old town is a warren of cobbled streets and narrow alleyways lined with little restaurants, hundreds of shops selling clothes, glassware and just about every knickknack you can imagine. It’s all incredibly clean, tidy and quiet. See the soaring St. Peter’s Cathedral, a Gothic cathedral adorned with beautiful stained glass, and the turreted Old Town Hall. For a good view of the old town and the market area go up to the rooftop terrace of the restaurant of the Kaufhof department store on the old market square. Thanks, Jim, for reminding me of much that we saw on the GCT river cruise. We visited so many towns, I really got them mixed up. Always glad to sort out towns for a friend, Dotty. 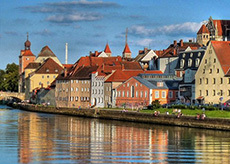 Superb article on riverside towns of Germany.